Java HashMap is a class which is used to perform operations such as inserting, deleting and locating elements in a map. We create a map, where we pass two kinds of values which are ‘key’ and ‘value’. While using HashMaps, values will be put in HashMap and whenever the user retrieves a value, the key will be used in order to use the value. The map is an interface that maps keys to the elements. Maps are unsorted and unordered. They allow one null key and multiple null values. The values are stored in key and value. One key or multiple values could be null in the entire HashMap. A key can be any object. There are corresponding values for each key where values can be null in the HashMap also. Here, we pass key and the value. Here, the values are present in the set so we use entrySet. 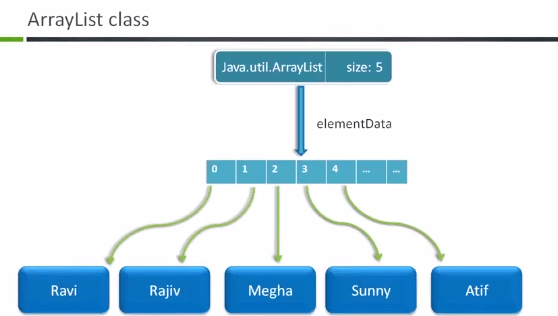 The ArrayList class is a concrete implementation of the list interface. It allows duplicate elements. Also a list can grow or shrink dynamically which is one of its main advantages. The demerit of an array is that once it is created it remains fixed. Here, the size of ArrayList is 5. Index starts from 0. 4) Here, we will find Java and util and within that we can find ArrayList. Here, duplicate values have been posted in ArrayList. It converts value to string and prints the element. Here, size is not an exception. It will read the first element and not the second element (Rose). How to trace elements of ArrayList? For-each loop – Its action is similar for loop. It races through all the elements of array or ArrayList. We don’t need to mention size of ArrayList. But in case of a simple loop we need to mention the size.